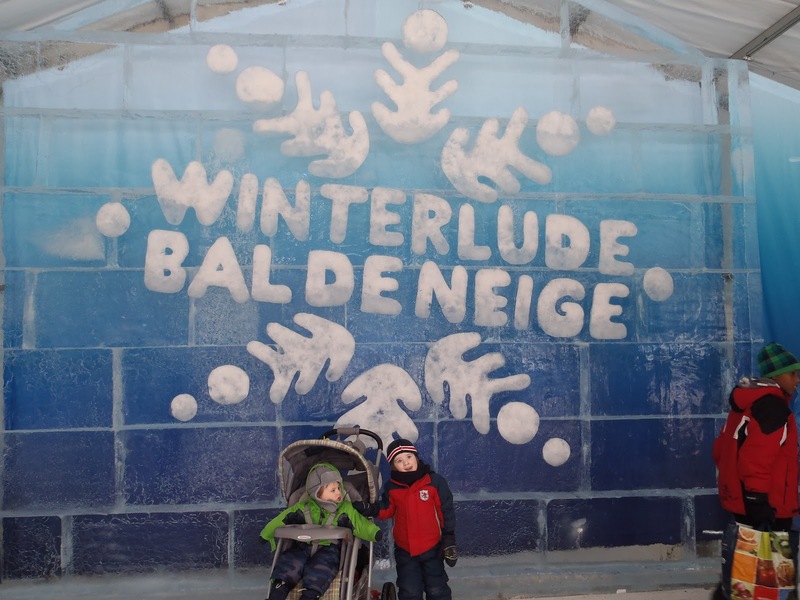 Tales of Mommyhood: Winterlude Fun! We go to downtown Ottawa, and normally take a walk down the rideau canal, stop in Confederation park to check out the ice sculptures and then pick up a beavertail when we are done. This year, we opted to forgo the Rideau Canal, and just headed to confed. park to check out the sculptures - unfortunately, due to the mild temperatures many of the ice sculptures were broken and missing pieces - but it was still nice to see. The boys had fun, it was pretty nice outside (except for a few windy periods) and it's another year of our tradition down! 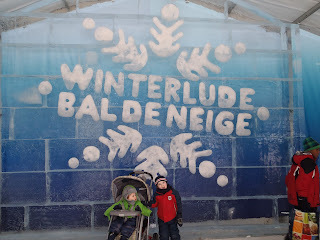 I only hope my boys have similar fond memories of winterlude that I have from my childhood! 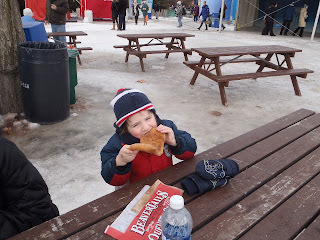 *sigh* this post makes me miss Ottawa & Beavertails. Ive only had them once in my life but let me tell you I have never forgotten!! They are definitely a treat that you need to taste yourself - not really describable in my oppinion! My work hasn't allowed us any free time to get down to Winterlude yet this year but I'm still holding out hope. 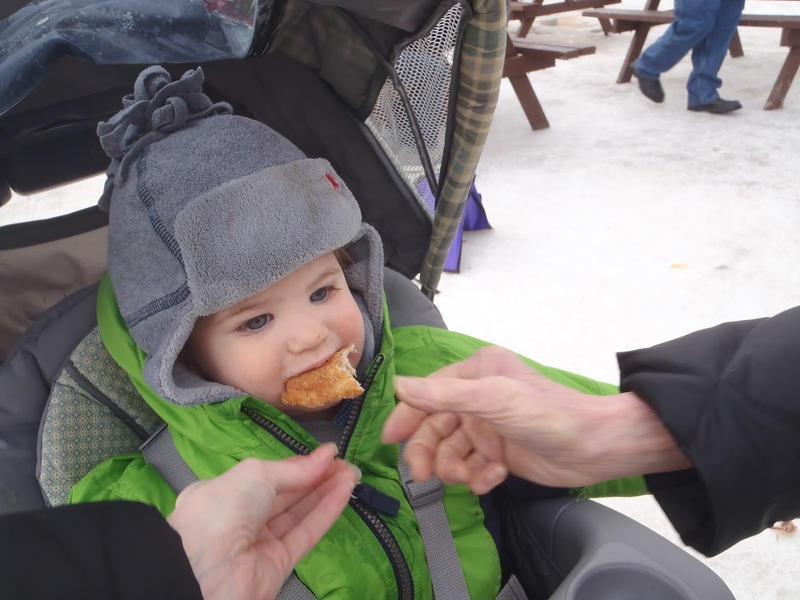 My son knows the joy of Beavertails but my daughter was too young to remember her first taste (I think). It's funny - J has never come with us - I hate crowds, so refuse to go on a weekend. Maybe when the kids get older...for now, they get to go with mom and gramz! So fun, I wish we lived closer!! We've barely had any snow in Toronto so far this year. It's actually kind of sad. 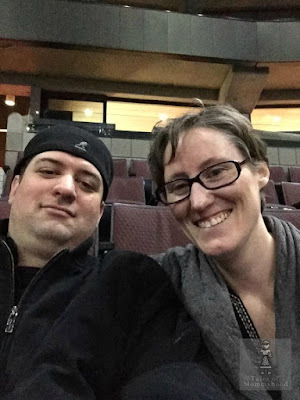 My Wife and I still hope to stop by Winterlude though. I haven't had a beaver tail in years and I'm craving it. We have the perfect amount of snow this year (we have had much less than normal) so I am pretty happy. Still enough to make it pretty, but not enough to spend hours shovelling out. We've barely gotten any so far. This was the first time we've ever had any really stay on the ground all winter. Yes, the canal is still open, as we have had cold temps overnight. It might be a little bumpy, but still skatable.! Sounds like a really great day and family outing :) It's good to have small traditions like that, and I'm sure it's something the kids will remember with joy. Every year I say we are going to go to Winterlude... but we never make it. I think next year since DS will be 2 1/2 it will be a fun age to take him.